Someone asked for examples of functional writing skills a few weeks ago on the FB page and it got my brain rolling!! So, I've spent the last few weekends putting together this packet that includes all kinds of functional writing skills. 34 to be exact! There are 44 pages in all as some skills are 2 pages. I am super excited to start working on these with my kids! My kids really struggle with this, so I'm hoping that by the time we're done (probably won't be this year) I will see some improvement in this area. If you think of something I can add, please email me and let me know. Click HERE to find it in my store and to see a more detailed list of the skills included. 4th Annual Christmas Card Exchange! It's almost that time again! Today I went back to my room for the first time since June. I spend 2 1/2 hours there and seriously, it looks worse now then when I started! I had purged a lot during the last week of ESY because I knew I had a few new things coming in. Little did I know, I would soon go on to spend about $150.00 on a whole bunch of stuff from NAEIR! So today was spent finding homes for all my new office supplies, goodies for our prize box, and a bunch of miscellaneous stuff I probably didn't need to begin with! I am also getting rid of all the books and magazines in my room. Nobody looks at them and they are just taking up a ton of space! I went through and pulled about half of them out to give to my 1 year old granddaughter and the rest I will donate. Since we are a transition program, many times I have students whose goals are related to finding a job. 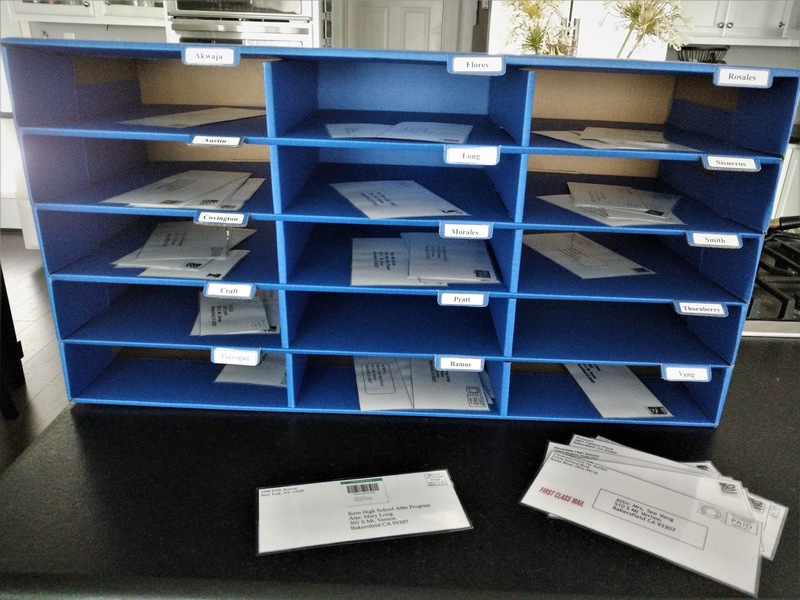 Since I am putting together goal boxes for each of them, I needed some sort of job search activity my kids could have in their box to practice reading and understand job listings. Is it part-time or full? What would I be doing? What are the qualifications? What is the pay, and how do I apply? There are 10 job listings included it the packet. Each of these listing was pulled from my local newspaper's web site. I did embellish slightly to make sure that each had enough information and may have included the pay, part-time or full time, and hours part of the ad. 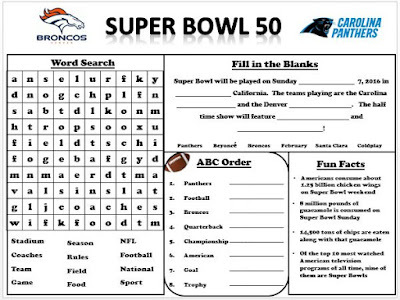 Also included in the packet are 3 different worksheets the students can use with the ads. One is a basic pros vs. cons. The next is almost the same but includes a couple questions and can be used independently. the last worksheets is a question and answer worksheet regarding the ad the student is working on. I will probably have my students do the question and answer worksheet first, then the first pros vs. cons. Since all my students, at some point of their 4 years with me, will likely have a job search goal, I will be doing the first job ad together as a group. Then I will add the other 9 to certain students goal boxes. Besides the two ads shown, the other ads are for: bank teller, cashier, receptionist, warehouse, delivery driver, caregiver, fast food, and child care worker. If you're interesting in this activity, you can find it HERE in my TPT store. This year I've decided to put together handbooks for the instructional assistants in my classroom. In the past I have always just done everything verbally but I felt as if I was having to go over things at least monthly regarding expectations I had for my IA's and also for my kids. I've had long term subs come in and also have had changes in staff throughout the year. Now, all the information will be in one place. All I will have to do is hand any new aide a handbook that will have all the information they will need about my classroom and my kids. The handbook will also include my IEP at a glance form for each student in our room. It includes basic information about each student, their goals and a list of activities the IA's can work on with the kids that will help us achieve the goal (games, task box numbers, etc.). Let me tell you what's included in the handbook. I am hoping the handbooks will be received well and they appreciate the information inside. I do plan on us going over it together within the first week of school. I am hoping that there will no longer be excuses of not knowing things as I will be able to refer back to the handbooks when needed. I am hoping too that they will now have more information regarding other students in our room and not just the 3 at their table who they are responsible for. I did run it by a good friend who is an IA at a different school (and a union rep) as well as my admin just to make sure everything in the handbook was fair of me to ask of them. I'll let you know what my aides think of their new handbooks in a few weeks. I know the time will go fast and before I know it my kids will be back and another year will begin. I'm starting out this year with 12 students. I've only had 10 the past couple years. The only bad part about that is I'm going to have to separate the "round table" where I do all my group lessons. So bummed :-( I think it will be too hard to try to move them together and back apart everyday. I do have in a request for one large table I can put in the back of the room. I'm even willing to give up a lot of my office area if we can find something that will work. I'll let you know how that goes. I'll post again next week! Hey there! I couldn't wait one more minute to share with you my NEW social story book I've put together! First let me give you a little info on our program. We are a life skills/transition program for students 18-22 years old. The students come to us from one of the 18 high schools in our city and also from a couple outer lying schools. So, imagine you're a kid (fun huh), you've just spent probably 4 years in the same classroom with the same 3 or 4 staff, and all of a sudden your 4 years are up and it's time to move on. Sad, nervous and super SCARY! Here's where I come in. I "offered", during a district training, to put together a social story to make the transition to my program just perhaps a little bit easier for our incoming kids. Luckily I had a lot of pictures already, so basically it was just putting everything together onto paper, printing, laminating, and binding. 13. Final page "everyone love coming to _____"
I think it turned out soooooo cool and I can't wait for feedback from the high schools! I know it's late in the year, but I've sent it off in digital form so they can at least show the kids who are attending ESY and will be heading our way in August. I did have to blur the kids faces :-( but I think it's still going to be helpful. Might even be something you could do for kids coming from elementary or junior high school??? Here are some examples of the pages I included. I think the goal this summer is to put 17 more of these bad boys together so each school will have one in their possession starting next year. So, let me know what you think and i'll be back soon! Well the 2016/17 school year is finished! Last Friday was the last day of school. Can't get too incredibly excited since ESY started the following Monday! No rest for the weary... YET! This year I decided it would be fun to have a country theme for each week. I let the kids choose what countries they wanted to vist. This week we went to Mexico! We learned about Mexico. We learned a few Spanish words. We made homemade nacho cheese sauce and pretty tissue paper flowers to decorate our room! And today we played Bingo and the kids helped me translate the words into Spanish. So much fun! I just know the next 3 weeks are going to fly by! There's a few things I have been working on and I can't wait to show you. Hopefully by early next week I will have my project ready and will post some pictures! I also went to a Google Classroom training last week and can't wait to start implementing new things in my room next year! I took notes and promise to share! Hope your summer is going great and if you haven't started yet, I hope it comes soon! Is everyone out there doing Kahoots with their kids? My kids absolutely love them! We have been doing one each week when we have access to the school Chrome Books. I've even tried NOT doing one a couple weeks ago and the kids were a little upset with me! I've made a few of my own and have been trying to base them on subjects we have been working on as a sort of post test to the unit. The best part is, if you didn't want to make your own, there are literally thousands to choose from that other teachers have made! The site is free to use. You just need to sign up for an account at kahoot.com. Then find a Kahoot you think your kids might enjoy (we did a Spongebob one last week just for fun) and click "play". After clicking your play option, "player or team" the site will give you a code for the kids to type into their Chrome Books at kahoot.it. They pick a nickname for themselves (my kids think this is one of the best parts) and your ready to go! I use the overhead to show the question and answers on the board and read them allowed to the kids. The kids then click the corresponding box on their Chrome Book to the answer they think is right. After each question, it will show who the top 5 players are. I love this because it doesn't show who's in last. At the end it will list your top three players. I have posted a picture of the games I have created so far if you would like to try any of them out. You can try clicking HERE to find them and if that doesn't work my username is "koriekiss" and you can just type that in the search bar. 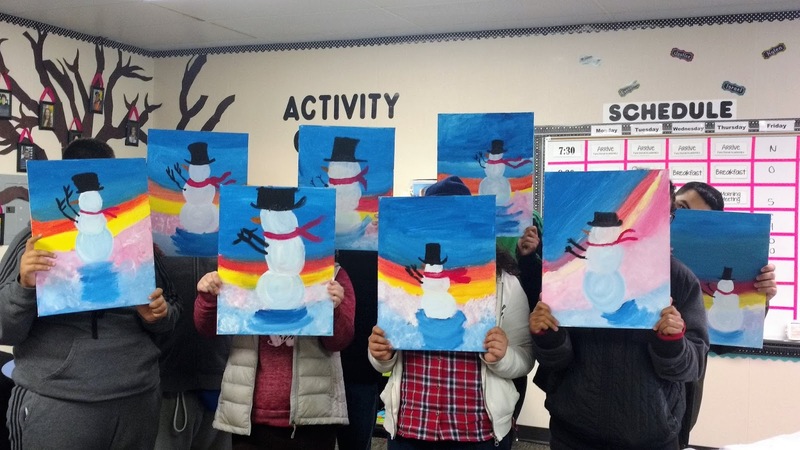 Have any of you had a opportunity to do a "Paint Nite" in your town? I've been to a few and they are so much fun. A group of about 25 to 50 people all meet (usually at a restaurant or bar). All the supplies you need from paint to aprons are set up for you and ready to go. You basically all paint the same scene, as your artist host shows you step by step instructions while she/he paints as well. There's music, cocktails and you may even make some friends! A few months ago we were gifted paint, easels, brushes, and enough canvas's for each student to do about 5 paintings from Donorschoose! We did a "free paint" back in October and it wasn't pretty. They just wanted to add paint to paint. Color over color. We had a few black blobs, lol. They had fun and that's really what was important but I knew this time I wanted it to be a bit more organized. Sure enough, there are a TON of "Paint Nite" artist on Youtube who do step by step directions for beginners!! I had the kids watch each step first with their paint brushes down, then re-watch it while following along with her as she painted again. When each step was finished I would pause the video while the kids finished the step and caught up to her. As you can see my kids did an amazing job! They were so proud of their work! I can't wait until we do it again! Hello - What Would You Do? Well hello there! It's been a while since I've posted I know. January was a very hectic month for me. A CASA case I accepted five and a half years ago was coming to an end and there was so many things to do to prepare her for emancipation. I had made a decision to take a break from CASA before taking on another case but literally 2 days later their was a sibling group that really needed an advocate and I felt it was where I needed to be. I also offered to take on a family findings case to try to find family for a child who knows none. So for the last 3 weeks I've been mining files every day after work, meeting my new kids, and acquainting myself with their social worker, attorney etc. It really is hard for me to say no when a child is involved. I have so many pictures on my phone of thing I want to share with you and am going to try to make an effort to do that regularly now that things have died down. So, first thing I'm sharing is some "what would you do" cards on independent living. We started these last week in my classroom and so far have done 10 of the cards. We spend about 5 minutes discussing each card. The kids seems to really enjoy brainstorming and coming up with solutions. There are 30 cards in total. I laminated mine so they would hopefully last a few years. I also put together a Kahoot quiz if your interesting that corresponds to the the cards. You can read more about how we are using them there. Update: We are no longer accepting participants. The 2016 Christmas Card Exchange is here!!! If you would like your class to participate, please email me at: Empoweredbythem@aol.com. Please include exactly how you would like the address to read (name, school, etc). I will have the list out to all participants sometime next week. Each participating class will be required to mail out one Christmas Card to each of the other schools on the list by the 5th of December. Cards can be store bought or homemade. I will stop the entries at 30 unless there is an overwhelming response in which case I will go to 50 and split the groups into two groups of 25. This is going to be FUN!!! I hope to hear from you soon! Well hello there! How's everyone's year going thus far? Been a super busy one for me. I have no idea why, but I feel like i'm just never getting caught up. I did want to share with you a new unit I put together over the last week though. I have actually used this as a goal in the past and thought it was about time I put together my own worksheets to help my kids achieve it. There are 15 worksheets in the packet and cover all kinds of graphs our kids would see in everyday life. Airport Fight Status, School Schedule, Football Schedule, Chore Chart, Store Hours, Work Schedule, Bank Registry, Weekly School Menu, TV Guide, Movie Theater, Event Schedule, Bus Schedule, Sock Size Chart, Train Schedule, and Fast Food Menu. Hope the kids have fun doing them! I haven't forgotten about you, I have a whole list of things I want to share. I'm going to try to find the time soon! Here we are again. The beginning of a new school year trying to get these IEP's out of the way so we can stop worrying and focus on teaching. I am fortunate this year that I only have 3 incoming freshman, and another student with an IEP due the first week of September. So, 4 IEP's isn't so bad the first month of school. I've had worse. We have to do 3 assessments on our kids prior to their IEP. One is always aptitude and second vocational. The third assessment I usually do is a student interview. Asking the kids questions about things they like to do, what they need help with, what things they do at home independently and so on. I usually just scratch it on a piece of paper and that's that. Well last year we got dinged by the state for not having the assessments in their IEP file. Since I didn't want to add a piece of scratch paper to the file, me and my fellow teachers did a little brainstorming today and put together an answer sheet to the questions we thought most important for the interview. This way we can jot down the answers and have something nice to put in the file. Welcome To The 2016/17 School Year! I know it's been a while since my last post but I took the summer off!! I am in the middle of a huge house remodel (we moved onto the main living area) so I tried to be gone as much as possible doing a little traveling and visiting family. The new school year started on Wednesday and so far so good. You know how some years you get it pretty easy and some years not so much? Well, I think this year is going to be a challenge for me. First off, my ratio of students with autism has gone above the 50% (7/4) that I prefer. 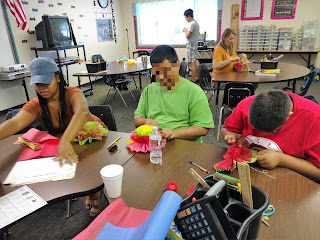 I rely on my more social students to help bring out the socialization in the others, so we will see how that goes. This year I have also decided to share with you the morning folder work that I do with my kids. I posted Augusts folder a few weeks ago and Septembers folder today. There is one worksheet (sometimes more) for each day of the month and they include all kids of activities like calendar skills, time, cooking, money, math, reading comprehension, food, alphabet, cut and paste etc... The schedule is in the thumbnail if you'd like to check out what it includes. I tried to keep the cost low as I assume you probably already own some of the worksheets in the packet. I hope it makes your day a little easier. Enough for now. I hope everyone's had a great start to the new year! I am getting an apartment this year so I'll have lots to share with you! I am not sure if I have mentioned this is the past, but I am a part of the transition committee for my high school district. We have met monthly for the last 3 months for: 1. We are planning and organizing a Transition Fair. 2. We are working towards getting uniform as far as transition goes for the 19 high schools in our district which includes putting together a matrix of what we will teach and also suggested informal assessments we can use. 3. We have been working towards putting together a portfolio that will follow the students through their 4 years of high school. The portfolio will contain information about the students abilities, interests, training's they have done, assessments, things they know, places they've been, and resources among other things. Now, I teach kids who have already finished their 4 years of high school, so we will start new portfolios when they come to us. We figured 8 years of information might be a bit much for one binder. The good news is, I will the opportunity to look at their high school portfolios before they get sent home for them to keep. So much more information that just having an IEP to look over for sure. Like I said above, we have been combing the internet for informal assessments for the past few months. The transition committee will be supplying 16 suggested assessments. There will be 2 vocational assessments and 2 aptitude assessments for each of the 4 years. Since my program starts after they leave high school I thought, why not put all the assessments together on the "U" drive (a drive that is accessible to all teachers in our program) and our 19 teachers can pick which ones work best for them? I also put hard copies of each assessment in a binder by the copy machine for quick access. I have given each assessment a rating (with help from my colleagues). Emerging, Intermediate, and advanced to again make it easier for teachers to know which ones might work best for their level of students. If it's an assessment that can be taken online, I just named the assessment ex. "Voc Online eLEARN" than put the link on a page for them to click on. Since we are not allowed to use the same assessments year after year I think it's going to be great to be able to go to one place and have a variety of good assessments to choose from. What we did find was, there was not a lot of informal assessments for our emerging kids. I would find an assessment that I thought might work only to be told by the emerging teachers that their kids wouldn't be able to do it. So what does one do? We make up their own! I did this one shown with the help from the emerging teachers. There are 33 activities in the set. 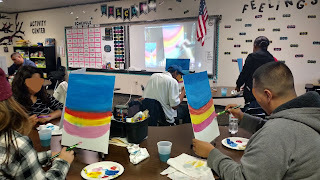 It can either be done by giving them both the "thumbs up" and the "thumbs down" cards and letting them choose which one, or as we did with a student the other day, gave him a choice of a few thumbs up activities and asked him which one he like and he chose. We were able to come up with a couple more "teacher fill in" assessments as well. I will be putting this in my store sometime in the near future. A couple of the photos I don't own so I will have to wait for my daughter in law to draw them for me so I can switch them out. It will be there before the new school year if you're interested. I can't believe there are only 14 more days left in my school year!! Where did the time go!?!? Inside each of the bags he had the kids place 2 graham crackers, a half cup of sliced peaches (we used spiced) and two heaping plastic spoonfuls of the cool whip. They then pushed the air out of their bags and zipped them closed. Then they kneaded them, and squeezed them until the crackers were broken up and the peaches squished into small chunks. Then he cut the corner off of each bag (or let them) and they squeezed the yummy goodness out into their mouths! The verdict.... It was a huge success! The kids loved it as well as my other staff! They said it tasted like peach cobbler. I think it would be a fun snack to take on a camping trip too! For St. Patrick's Day I though it would be really cute for my kids to pass out these No Bully signs to the other students in our program. Of course I'm not thinking at the time that there are 150 kids in my program and this might be a little more time consuming than I had wished. Or the fact that I have very few kids who can cut well with scissors. I found the rainbow part on line and cut and pasted it into my circle and added the words. They had the words as well but it was easier to shape it doing it myself. I was able to get 4 per page and printed them in color on cardstock. Today we started the task of cutting and taping them to a St. Patrick's pencil from the Dollar Tree. With free printing in the office, the whole project only cost me 12 dollars in pencils! With kids and my aides cutting today, and a group of us taping, we were able to finish about 50 of them. So glad we started early! I absolutely love my cooking classes I do with my kids. Seriously, I pretend I have my own cooking show and millions of special ed kids are sitting at home watching me, lol. Might be my second calling now that I think about it. So, I have a couple of kids in my class who love cooking.They help at home making meals and spend their free time looking through my cooking magazines while at school. After continuous conversations about them cooking, I decided I was being unfair and it was time to pass the baton and let them teach a class. During a morning meeting I mentioned it to the kids and sure enough about half of them were eager to sign up. Here's what the kids want to cook....chilaquiles, grilled cheese sandwiches, peach cobbler (in a ziplock bag), "famous" quesadillas, and pizza. Yesterday was our first class. One of my boys made chilaquiles and they were amazing. He was absolutely adorable telling us each step along the way! One of my aides acted as his sous chef and did the actually cooking but he cut the tortillas, added them with the oil to the pan. Opened the cans, cracked the eggs, seasoned everything, added everything, topped it with the cheese and served his classmates! We taped him on the iPad, and he was so proud of himself. I wished I would have saved the grocery list he gave me to show you. He included a picture of each item next to the name. Why didn't I think of that before I used to send my ex-husband to the store, lol. I can't wait for my other kids to get a chance to have their own cooking show soon. It's well worth stepping down and watching them shine. You buy 5 years worth of Christmas Card Exchange cards because they were 75% off!! And 75% off $2.86 is practically NOTHING! Alright, here it is! What I have been working on for the past week+! A collection of community resource information pages for our students. Here's a little back story and how, at times, inspiration hits me. I am part of a transition committee for our local high school district. We've only met twice so we are in the beginning stages of deciding what is needed. So far we have been putting most of our energy into setting up a transition fair for our kids and their families. The fair will be held during the evening hours at a central location in our town. Also invited will be any programs or services that our families need to know about in order to help prepare them for their transition from high school to adulthood. Ok, so during our last meeting, there was much talk about the need of getting all these resources to our kids during their time they are with us. Since I have portfolio's for each of my students, I thought... hey, why not come up with an informational page on each of the resources available? This way, after it is discussed in class or we visit, the paper will go into their portfolio under their "resource" tab for them to have with them when they graduate. Think about it. I take Johnny to visit one of the resources in his sophomore year of school. What is he really going to remember about that resource and how they can help him 2 to 3 years later? Right? I pretty much just cut all the information from each of the websites that I thought was important and informative. Then pasted it onto a document. I made sure to add the website for those who will have access and added addresses and phone numbers as well for easy contact. There are 27 pages in all and I am sure through the years there will be more that will need to be added. I am hopeful that these documents will be of great resource to our kids and their parents once they leave us. 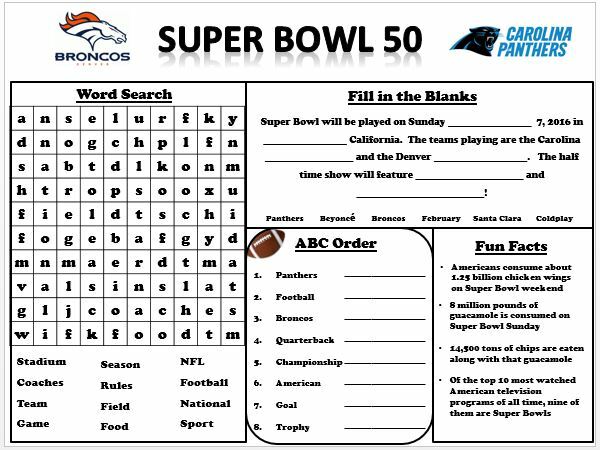 Here it is, your 2016 FREE Super Bowl activity sheet! And thank you to those who messaged me. I don't watch football and to be honest, I didn't have a clue it was this coming weekend! I have been soooo busy. Literally spent all weekend and after school working on a transition idea I had. I'll let you in on it when I get it a little more complete. I would LOVE your input.